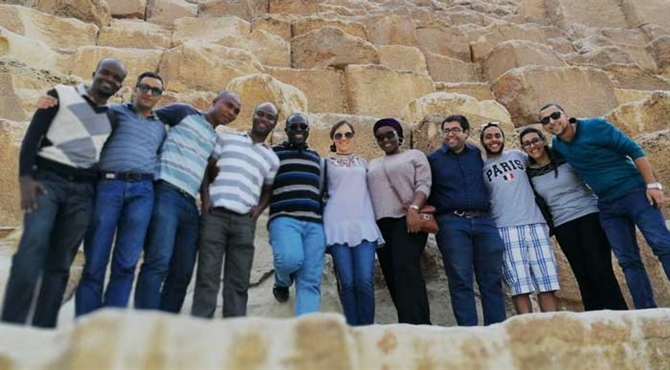 In late November 2017, in my dual role as ISMC president and global CEO of The HuD Group, I gathered eight emerging leaders (mostly former international students, half of them Canadian alumni) from Colombia, Gambia, Ghana, Nigeria, Rwanda/Uganda, Egypt, Canada, and Cote d’Ivoire for a retreat in Egypt. I challenged them to live and lead from a place of deep divine transformation and our authentic selves. The retreat’s theme was Strengthening the Soul of our Leadership. Using Moses’ life as a lens, what better context to explore this than in Moses’ Egypt! While we were there, the deadliest terrorist attack in modern Egyptian history took place, with the death toll reaching over 300. Speak of impact amidst terror! Our alumnus, M., leads the small, persecuted body of Christ in Egypt to lovingly engage Muslim neighbors by providing healthcare and essential services. The pastors and churches M. influences (we met three of them) feed their Muslim neighbors every day during Ramadan as they break their fast. M. is applying what he learned in Canada to conduct such a community transformation. What’s the point? ISMC’s mandate is not to directly impact the world per se, but to empower internationals like M. and his cohort to then impact the world as He leads them. Who would think a tender shoot of impact would grow out of such a dry ground of persecution and terror? It is only the doing of the Lord and is marvelous in our eyes! Please pray for Egypt and the continued impact of our alumni there, especially M. Without doubt, our international alumni are impacting the world through Jesus Christ! Hallelujah!